Lord Vhalantru has risen far and fast during his life. He was raised in an orphanage, trained in Sasserine as a sailor, and through some incredible luck and skill on his part, managed to make a vast fortune in the shipping business. At age 35, he sold his business and moved to Cauldron, where a sizable donation to the restoration of Town Hall bought him a (controversial at the time) noble title. Vhalantru is currently a wealthy bacholer, a notorious lush, and a patron both of the arts and the city’s adventuring community. 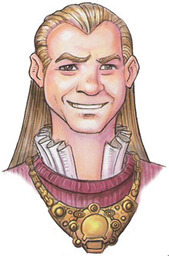 He has sired no children of his own, but should he adopt one, his given name of Vhalantru would be used as their surname (as an orphan, he legally has no surname of his own). He is also a close friend of Lord Mayor Severn Navalant, and a member of his Small Council. He has so far championed the position that the moneys raised by the recent tax increases should be reinvested into the city to rebuild the damage and help local businesses, rather than to increase the strength of The Town Guard. Although he is a human, Lord Vhalantru is an enthusiast for all things elven, and is a collector of elven poetry and artwork. In recent days, Vhalantru sponsored a feast in honor of the Stormblade’s victory over the kobold chieftain and his local minions. Also, Vhalantru’s urban renewal project has aided the Moonhowlers by renovating the exterior of Gerran’s new brothel.